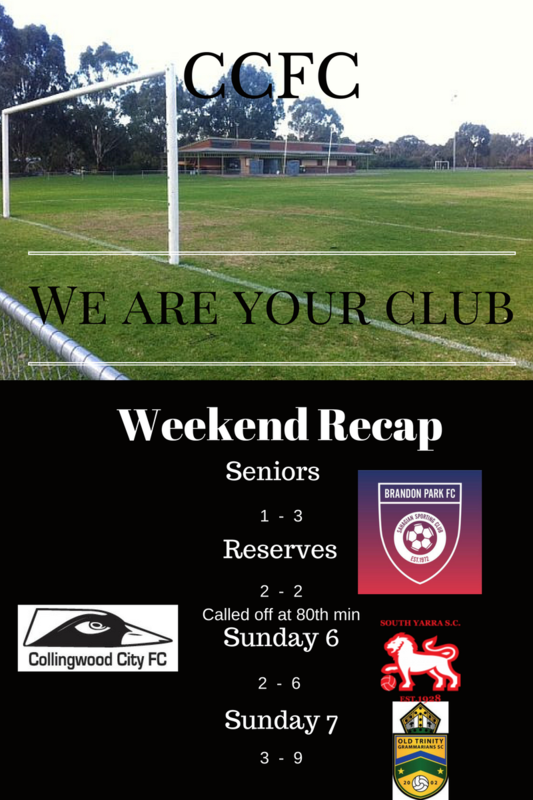 For the Seniors and Reserves it was a familiar face and a familiar place as we took on Brandon Park FC this past weekend, having both been promoted from State 4 East this past season. The reserves went down 0-1 in the first half, but made up for it quickly in the second. A dangerous ball whipped in by Josh Frewen from a short corner connected with no one, but was curling towards goal and hit the back of the net to level us. Sadly within a minute we would be down again after miscommunication at the back gifted an open net to a Parker player. We leveled the match with 80 minutes left by way of Dylan Hartog. After the goal had been scored, the linesman threw up the flag for offsides (not the case) and the referee, having already given the goal found himself surrounded by the home side players. The match was whistled over at that point, leaving both squads to pick up and change with a further ten minutes in regulation to go. The seniors would get off to a rocky start with two goals being scored in the opening five minutes. Chris Thorogood would link up along the right side to bring us back within touching distance of the home side, but another first half goal from Brandon Park sealed our fate. There would be some final fireworks however with one of our players being drug down by the last defender and no card given or player sent off. Another foul committed in the box against us, no card no player sent off. And lastly one of our players being lashed out at and kicked in the chest, only to see both players get yellow cards. Our Sunday 6s winning streak ended at two matches with a 2-6 loss against South Yarra today, with both goals coming from Paul Neff. The Sunday 7 team got their first points with a 3-3 draw against Old Trinity Grammarians, which is sad considering they were leading 3-0 in the first half with goals from Dave Kilcommons, Luke Pettican, and one time player-once again player Kris Clements. It should have been four goals, but a PK went wanting after it was sent straight at the Grammarian goalie.